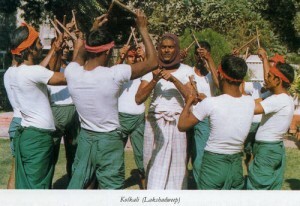 The marriage dance of Lakshadweep is called Kolkali. It is performed by men only. About twelve to sixteen dancers perform the dance. They beat two sticks that provide the percussion music. The leader plays a pair of cymbals. The dress of the dancers is very simple consisting of a lungi, a banian, and a scarf over the head. The dance begins with a slow tempo that gradually increases and become quite vigorous at the finale.